Bio: Mick Abbott was born in Derbyshire, England. His received his formal art training at Derby, Stourbridge and Chelsea Colleges of Art. 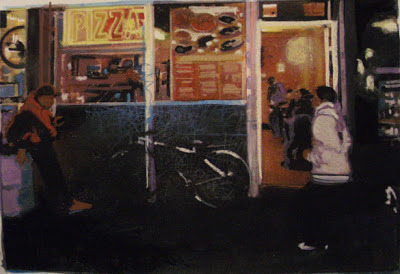 Mick Abbott is a full time artist, dividing his time between Cambridge, Brittany and New York. He has a fascination and fondness for gardens, landscapes, and medieval churches. He was a full-time art teacher at Comberton Village College, Cambridge for 22 years and loved it. He has been Artist-in-Residence for the National Trust in locations as varied as Stourhead, Knightshayes Court, and the Orchard at Grantchester. Mick has been accorded Signature Membership of the Pastel Society of America. Medium: Pastel, Oil, Watercolour, Graphite. Most of the gallery pages contain pastels, with the exception of Brittany Landscapes, the medieval pages, Life Drawings, New York City and Newark. Mick uses pastel over washes quite a lot. Navigation: Main menu disappears once in the gallery pages. Gallery: Hanbury Hall, England; Brittany Landscapes; New York State Landscapes; Medieval Drawings; Modern Medieval; Botanical; Paradise and other places; Life Drawings; Portraits; New York City Sketches; Cambridge; Newark Park.